Body fat certainly has a bad reputation, but it turns out that not all fat is equal. There's growing evidence that brown fat can actually be beneficial for your health and weight, and the more of it you have, the better. In the latest study, published last week in the journal Diabetes, researchers found that people with higher levels of brown fat may have a reduced risk for obesity and diabetes. Brown fat, also known as brown adipose tissue, appears to improve insulin sensitivity, while also helping to control blood sugar and increase fat-burning metabolism. So what exactly is brown fat, and why are we suddenly hearing so much about it? Brown fat, which owes its name to the high density of iron-containing mitochondria in the cells, has only become a hot research topic in the past few years. It was previously thought that brown fat was prevalent in newborns and then disappeared as they grew up. But in a 2009 study published in the New England Journal of Medicine, researchers found that brown fat can indeed still be found in adults. Younger people tend to have more of it than older adults. The same study determined that brown fat appeared to be more abundant in slim people and in women. In infants, brown fat in the upper body plays a key role in helping babies stay warm and protecting them from hypothermia. In adults, remaining brown fat is located in small amounts on the side of the neck, in the upper back, along the spine and in the dip between the collarbone and the shoulder. Since its discovery in adults, additional studies have suggested its heat-regulating function can help burn calories and contribute to weight loss. Unlike white fat, which expands as a result of consuming more calories than we burn off, brown fat plays a different role in the body. While white fat is mainly used to store energy, brown fat keeps the body warm by burning calories once it is activated. Even better, brown fat seems to primarily "pick" those calories that come from fat and sugar, Labros Sidossis, a professor of internal medicine in the division of geriatric medicine at the University of Texas Medical Branch at Galveston, told CBS News. This in turn may be particularly helpful in fighting health issues such as diabetes and being overweight. 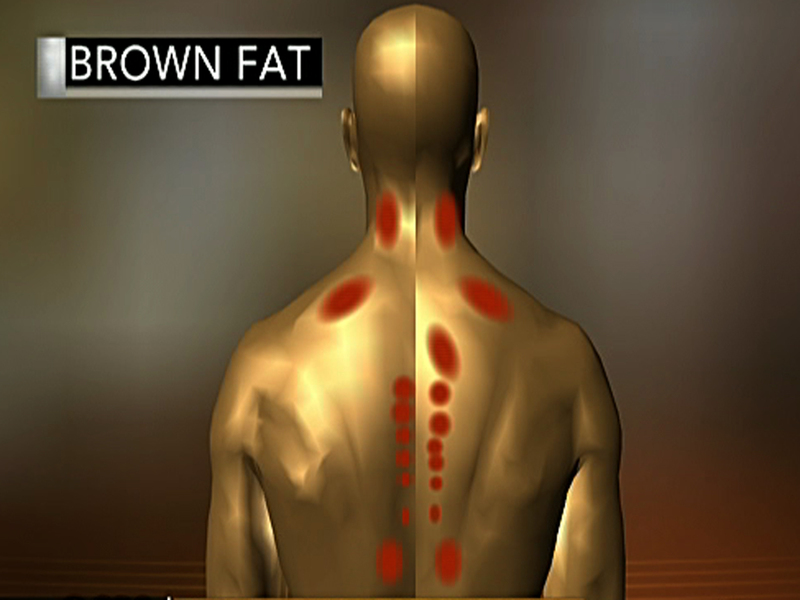 "If you can activate it [brown fat], it can help you burn calories," Sidossis said. So what do you need to do to activate this internal calorie furnace? Not much, in terms of physical effort. Since the main function of brown fat is to keep the keep the body warm, the best way to put it to work is to simply expose the body to colder temperatures than it's used to. It starts to work even if temperatures are just slightly lower, around 70 degrees Fahrenheit, Sidossis said. Once it is activated, brown fat can burn up to 300 calories in 24 hours, he said. A study published last winter found that shivering in cold temperatures for 10 to 15 minutes could have the same hormonal effect as an hour of moderate exercise. And there is more good news: you can not only activate your brown fat, but you can actually grow it. If you keep exposing yourself to colder temperatures for a few weeks, the amount of this "good" fat in your body can expand, Sidossis said. The amount of brown fat in an average adult is relatively scarce, ranging from 20 grams to 120 or 130 grams, Sidossis said, adding that not every adult has it, either. Obese and elderly people are less likely to have brown fat, he said. Brown fat may potentially have additional health benefits. Some animal studies have suggested that it may also help help lower high blood pressure, but that has not been confirmed in studies on humans yet, Sidossis said. Researchers are now hoping to develop medications that would trigger the activation of brown fat for a certain period of time so that people can get all the benefits without having to get exposed to colder temperatures, he said.